Last March the Cassini spacecraft tasted and sampled a surprising organic brew erupting in geyser-like fashion not from Yellowstone National Park, but from Saturn's moon Enceladus during a close flyby on 12 March. Scientists are amazed that this tiny moon is so active, ‘hot’ and brimming with water vapour and organic chemicals. Heat maps of the surface show higher temperatures than previously known in the south polar region, with hot tracks running the length of giant fissures. Additionally, scientists say the organics ‘taste and smell’ like some of those found in a comet. The jets themselves harmlessly peppered Cassini, exerting measurable torque on the spacecraft, and providing an indirect measure of the plume density. "Enceladus is by no means a comet. Comets have tails and orbit the sun, and Enceladus's activity is powered by internal heat while comet activity is powered by sunlight. 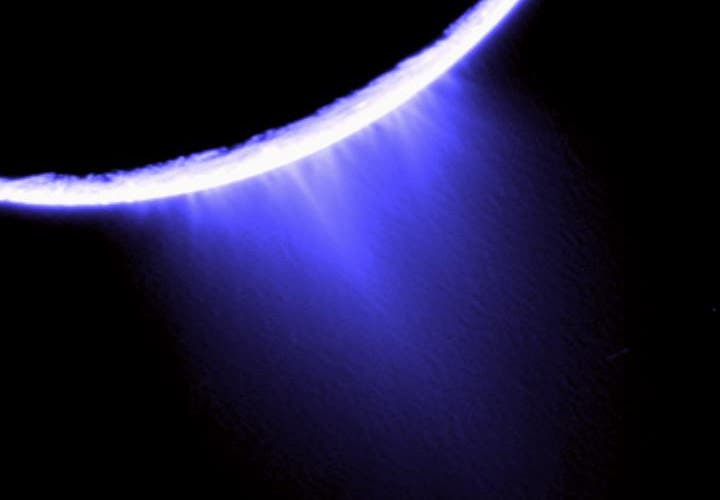 Enceladus's brew is like carbonated water with an essence of natural gas," said Waite. The Ion and Neutral Mass Spectrometer saw a much higher density of volatile gases, water vapour, carbon dioxide and carbon monoxide, as well as organic materials, some twenty times denser than expected. This dramatic increase in density was evident as the spacecraft flew over the area of the plumes. New high-resolution heat maps of the south pole by Cassini's Composite Infrared Spectrometer show that the so-called tiger stripes, giant fissures that are the source of the geysers, are warm along almost their entire lengths, and reveal other warm fissures nearby. These more precise new measurements reveal temperatures of at least minus 93º Celsius. That is 17º warmer than previously seen and 93º Celsius warmer than other regions of the moon. The warmest regions along the tiger stripes correspond to two of the jet locations seen in Cassini images. "These spectacular new data will really help us understand what powers the geysers. The surprisingly high temperatures make it more likely that there's liquid water not far below the surface," said John Spencer, Cassini scientist on the Composite Infrared Spectrometer team at the Southwest Research Institute in Colorado, USA. Previous ultraviolet observations showed four jet sources, matching the locations of the plumes seen in previous images. This indicates that gas in the plume blasts off the surface into space, blending to form the larger plume.